Did you know there are nearly 20 essential vitamins and minerals in one serving of avocado? Snack happy with our guacamole recipe – it’s packed with essential vitamins and minerals (plus a daily serving of fruit and veggies). Talk about one healthy snack! 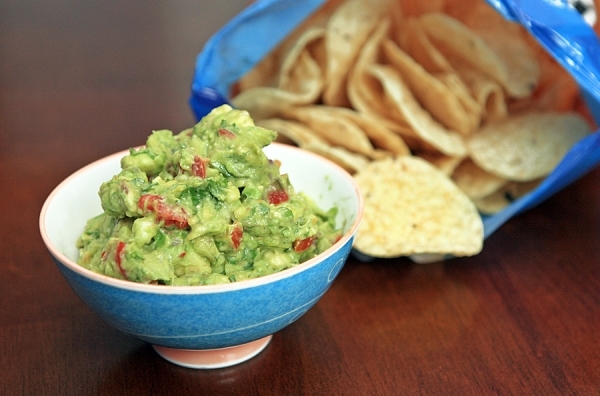 Serve it up our guacamole this football season with some homemade tortilla chips. If you’re watching your waistline, use raw veggies like peppers, celery, carrots or snap peas instead. If you’re like us and chips are a must, buy those baked scoops with half the calories. Open both avocados and take out the pit. Scoop out the insides and dice into large chunks. Place avocado chunks into a bowl and pour lime juice and zest on top. Placing the lime juice on top helps prevent the avocado from browning. Add a pinch of salt and pepper. Add in the remaining ingredients: chopped cilantro, red bell pepper, red onion, tomato. Gently fold together. Drizzle in olive oil to coat. Taste and add additional salt and pepper if needed. Serve with your choice of chips or raw vegetables. In a large skillet, allow oil to come to temp (350) over medium heat. Cut tortillas into large triangles. You can normally get about 6-8 per disk. When your oil is ready, add in a handful of into the oil. Be careful, they can splatter and burn you. Babysit them - do not walk away, they only take about 1-2 minutes to crisp up. Remove and allow to drain on a cookie sheet lined with a paper bag. Salt while the chips are still hot. Enjoy! Do you like avocados as much as I do? What are your favorite game day snacks? I love garlic so when I make mine at home I press garlic to taste. There are no rules. Another thing done differently here is they will make a sauce to pour over your favorite taco or gordito made with avocados, cilantro, milk, and salt. Not sure of the amounts though, I have never made it. When I have time I will share another very different local item called tuna cake. Believe me it is nothing like a crab cake. It’s so good to get fresh ideas! Keep up the good job, Tinsley!